Gear up to become the fastest racer in the neighborhood with the Disney Pixar© Cars 3™ Ride Around Racer by step 2. 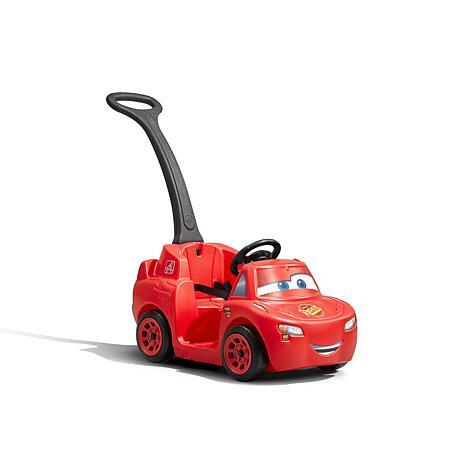 Toddlers will want to take a quick spin around the track in their Lightning McQueen-themed push car. This kid’s ride-on features an interactive steering wheel with real honking horn to let your little one pretend they are driving Lightning McQueen. 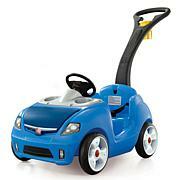 Kiddos will enjoy a comfortable stroll around the park or zoo in this sturdy and spacious toddler racing ride-on. Made in USA of US and imported parts. Adult assembly required. 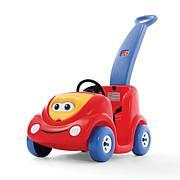 Lightning McQueen stylized push car allows little ones the ultimate Cars experience! 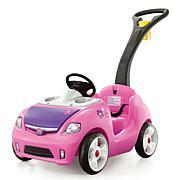 Movable steering wheel allows children to pretend steer the racer while honking the squeaky horn. Widened body style allows kiddos to take their favorite toys and snacks with them for long neighborhood walks! 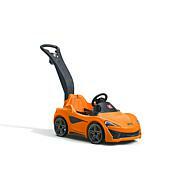 Sleek design features Lightning McQueen design with Cars-inspired decals. Safety belt (included) helps keep little ones safe and securely buckled in while riding around. Item dimensions: 35x34x16.5 in. Age range: 18-36 months. Limited 3 year manufacturer warranty 800-347-8372. I bought one of these for my son and a family members one year old for Christmas. We havent put ours together yet but they did and its very well made and perfect for children that age. I would buy again!